George Carlin for nearly three decades (1977 to 2005) has been provoking, challenging, and questioning just about everything. 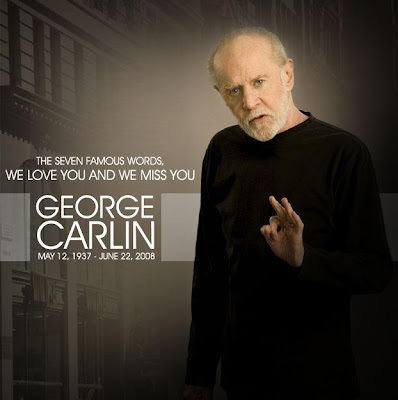 One of the funniest and most incredibly intelligent man out there….he’ll be missed. I picked a few pieces from his website that made me laugh, http://www.georgecarlin.com/. I wish I could say more, but I think he says it best himself so check out his website and any of the cable specials when you can-you won’t be dissappointed. George Carlin spends a lot of time pondering the universe. For example, he worries about the gloves that deli sandwich makers now use. Where have they been and who wants latex on his sandwich? He wonders, too, about the PC police who refer to ugly people as “people with severe appearance deficits.” And why do they lock the public bathrooms at gas stations? Are they afraid that someone will clean them? In When Will Jesus Bring the Pork Chops?, Carlin probes life’s deeper mysteries and emerges with many answers and very dirty hands. In the expression “topsy-turvy,” what exactly is meant by “turvy”? George Carlin asks many more nonsensical questions like that one in the 256 pages of this new hardcover collection of mockery. If you’ve read his first book, Braindroppings (and if you haven’t, buy it immediately) you’re going to devour this new collection of Carlin-isms. This is the audio version of the recent HBO show.